As with any product, it is extremely important to buy good quality equipment. This will make your beer taste better and make the brewing process a whole lot easier and much more enjoyable. Buying a cheap wort chiller can result in contamination, inefficient cooling and most commonly, leaks. Buying a quality wort chiller will speed up the brewing process and also significantly reduce the risk of contamination. Wort coolers aren’t very expensive, so there is no reason to buy a cheap knock off. Go for the quality. To help you out, here is a short list of the five best wort chillers I have found to be the choice in most homebrew situations. 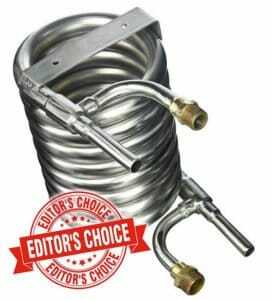 9 What is the Best Wort Chiller? 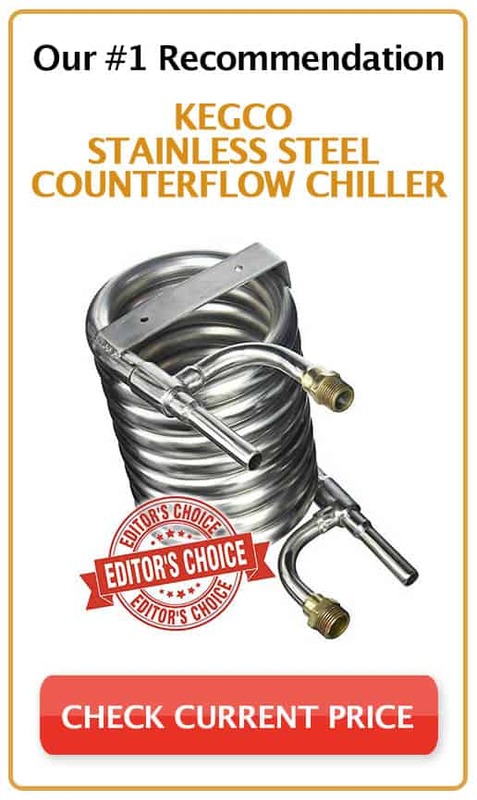 Look no further than Kegco’s counterflow wort chiller. As you may (or may not) know, counterflow wort chillers will leave immersion and plate chillers behind the dust in terms of chilling time, and I’m not just saying that. I’ve been using this counterflow wort chiller exclusively for the past year, and the results have been phenomenal. It’s able to chill my wort twice as fast as my old immersion chiller. On average, I’m able to chill a 5-gallon batch in 15 minutes and a 10-gallon batch in just 20 minutes. Due to the counterflow design, you do not submerge this chiller into the wort, making it compatible with brew kettles or pots of all sizes. The best part is that since it’s made of stainless steel, you won’t need to worry about corrosion, so you know it’s built to last. As you may know already, NY Brew Supply has a wide variety of excellent home brew supplies. They cover a lot of ground providing everything you need to brew and serve beer. Among the many wort chillers they have available, this counterflow chiller is quite efficient and incredible. This counterflow wort cooler works differently than the immersion chillers you may be used to. You do not submerge this chiller into the wort. Rather, the wort and water flow through the chiller. This method drastically reduces the time it takes to cool your boil. I’ve been using both the ExChilerator and this counterflow wort chiller exclusively for the past year and the results have been phenomenal. This is another very simple design that makes cooling wort an easy task. Not to mention the time you save yourself if you don’t currently own one and are just sitting around waiting for your wort to chill. 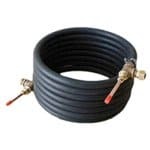 This cooling coil is made from high quality 3/8” copper tubing with bronze fittings for maximum efficiency and also comes with vinyl tubing and a garden hose adapter for cold water in. Leaks are rare with this product as long as you have everything seated well. NY Brew Supply is a leader in the homebrew world, and there certainly is a reason for it. 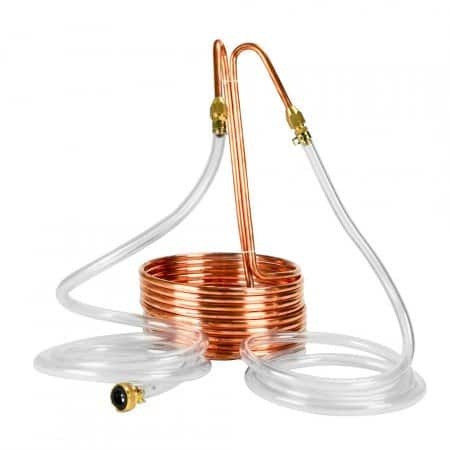 If you’re starting out, we recommend going with a copper immersion chiller like this one. 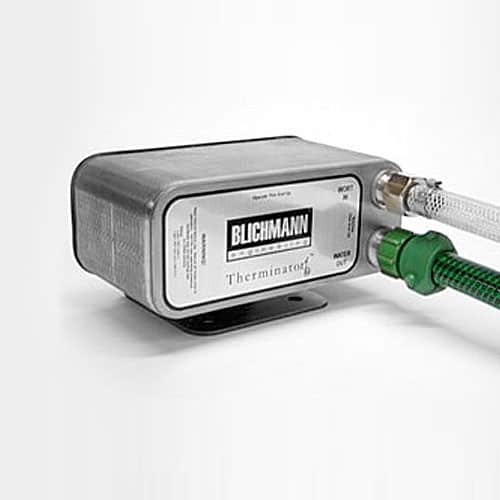 The Blichmann Therminator is a top-notch plate style wort cooler. Since it’s from Blichmann, you know that the quality is outstanding and it’ll be tough to find another plate chiller that can compete with the build quality of this unit. The Therminator is built from high quality 316 stainless steel plates that are brazed together with oxygen free copper. In about 5 minutes, the Therminator can cool down 10 gallons of boiling wort to pitching temperature using 58°F at 5 gpm. You’ll be hard pressed to find another plate chiller that is as efficient as the Blichmann Therminator. With plate wort chillers, cleaning is very important so we highly suggest picking up the Therminator Backflush Assembly for proper cleaning. The Copperhead Immersion Chiller is perhaps the simplest and easiest design out there. It may not be the most efficient option for a wort cooler, but it is the easiest to use and requires very little setup and prep. Just clean, immerse and start the cold-water flow. The Copperhead immersion chiller comes with everything you need including the copper coil, tubing, hose clamps and barbed fittings. The Copperhead also incorporates a drop angle design that keeps the fitting away from the wort in case of a leak. The immersion cooler will chill around 5 gallons of boiling wort in about 20 min using 55°F water. Much slower than the plate wort chiller but still way faster than waiting to hit room temp. 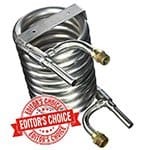 This stainless steel immersion cooler from NY Brew Supply is a basic immersion chiller that proves to be simple and easy to use, which makes it very handy for anyone just starting out on their homebrew adventure. 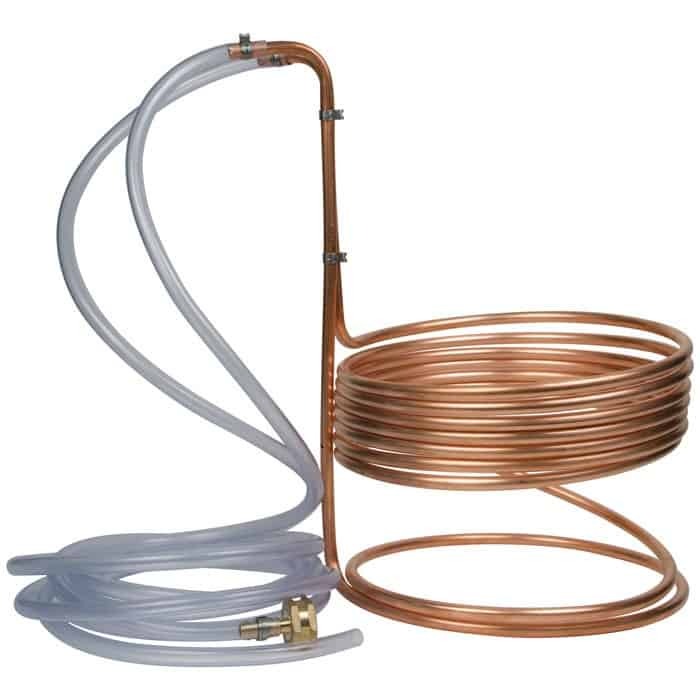 NY Brew Supply’s immersion chiller comes in either copper or stainless steel with your choice of a few different lengths: 20’, 25’, and 50’. 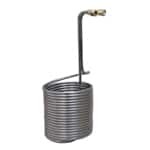 At each end of the wort cooler is a clear vinyl tube fitted with a quality brass garden hose style fitting that allows for an easy connection to nearly any water source. They supply you with 12 ft vinyl tubing so you can cut it to your desired length, which I think is great. 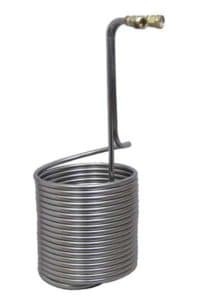 If you don’t own a wort cooler yet and want to take the plunge, this is a great option. You won’t be disappointed. One of the disadvantages of stainless steel is that it is hard to manipulate. Copper immersion chillers are also observed not to be as firm as the stainless steel. As you can see, both have their fair share of pros and cons so choosing your chiller must depend on what is more convenient for you. But if you will ask professional advice, the copper immersion chiller is found to be more efficient especially when you are chilling a 5 or more-gallon batch of wort. 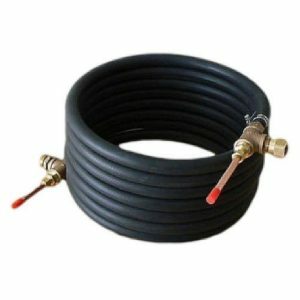 What is the Best Wort Chiller? If you are a beginner to intermediate homebrewer, I would suggest picking up an immersion style chiller like the one from Copperhead. These things are built with quality and attention to detail. They also come with everything you need to efficiently chill your wort without accumulating a headache from all the hoses and water inlets and outlets. If you have a more advance setup and want something even more efficient than the one listed above, the NY Brew Supply Deluxe counterflow wort chiller is a fantastic choice. It’s one of the most efficient and fastest ways to chill your wort, and lots of it. Now that you’ve hopefully landed on which DIY chiller will best fit your needs, let the chilling begin!